As presence information are stored in the SQL database, I said to myself there is an issue with the user account in the database. I found the user and his resourceid, keep it in mind. Delete the account from the Control Panel or by powershell and relaunch the previous query. I still found the user but with a different resourceid. I wait for some minutes and recreate the Skype account using the Control Panel or Powershell and VOILA. The user was able to change his status and the others were seeing him correctly. When I tried to call the user from my mobile, I got the voicemail in the right language (french in our example). Then I finally found that it was due to the caller mailbox language ! If the caller is having an Exchange mailbox in English then he will reach a voicemail in English. So this is not an issue but it is per design ! New day, new challenge ! Even they disconnect and uninstall the application, simultaneous ringing was no more working for their mobile device set in AD but it was working with another number. Then simultaneous ringing start to work again for those users who were using the mobile app. It has been a long time since I have not write a new post but that day I got a new issue. On a fresh new Skype for Business environment, I had an issue with the Powerpoint sharing no more working (was working some days ago…). So I started to check all my config and check what changes I have done since it is no more working, I haven’t found something related to this issue. So I used fiddler to check what is happening on the client side and see that the client never tried to reach the Office Web App server so I understood that the error was between the Lync/S4B client and the front-end. And remember that the admin installed some updates in the last days. In my case, the key “HKEY_LOCAL_MACHINE\Software\Microsoft\.NETFramework\v4.0.30319\System.Net.ServicePointManager.SchSendAuxRecord” wasn’t existing on my front-end so I created it and created the DWORD value. I restarted the RCTDATAMCU and after restarting my S4B client, the powerpoint sharing worked again !!!!! I would like to thanks Tom for his help. Usually, we need to perform an export/import of the contacts of a user for a migration purposes. Today, someone asked me to delete a Lync account and enable a Lync Account on a new AD account and migrate the contacts from the old one to the new one. This is something possible with the commands “Export-csUserData” and “Update-csUserData”. Don’t use the command “import-csUserData” because it will not work. The difference between the two commands is that “import” replace while “update” just append the data (which is not a problem as the destination is new). If the user also changed his SIP address, then there is an extra step where you need to edit the file called DocItem in the zip file before launching the command to update. Open it with text editor and replace any occurence of the old SIP address with the new one then save it. Replace the file previously edited in the zip file and launch the update. If you can get the xml content without getting an Exchange form authentication, you are good with autodiscover. If you are getting a form, change the setting in your Exchange organization or remove the pre-auth in your TMG rule (external access). If you are getting a prompt for authentication, you are good. If you are getting a form then same thing as autodiscover, change the setting in your Exchange organization or remove the pre-auth in your TMG rule (external access). 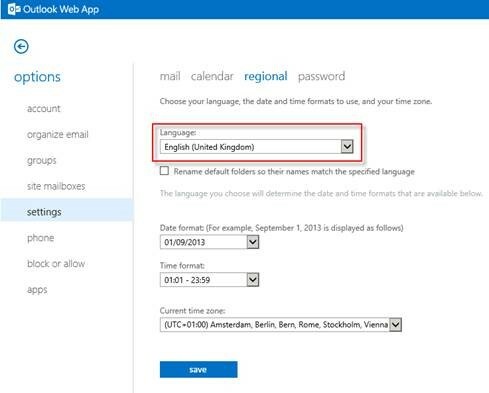 Indeed, when starting your Lync or Skype for Business client, in order to retrieve the EWS URL it is launching an autodiscover request based on your primary SMTP address which is getting thanks to in-band provisioning process. It is also explaining that even you set up only one federation route A/V traffic will go through each respective Edge pool, only SIP, IM will go through the Edge pool set for the federation route. 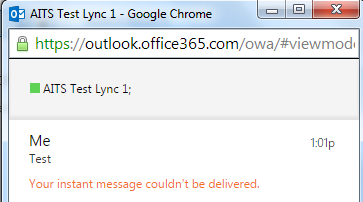 Some weeks ago, we found that our OWA(O365)-Lync(On-Prem) integration was not working completely. After troubleshooting with MS, we found that the issue was the fact that we had for each front-end pool a different federation route. Each front-end pool was using it’s own Edge pool for federation and that caused the issue.